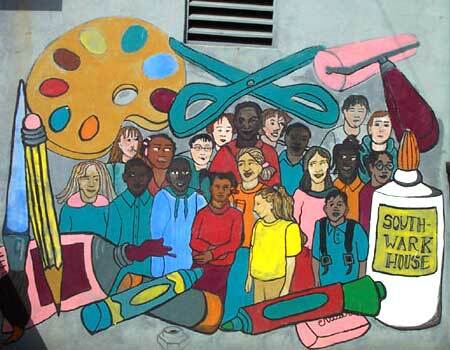 Art Sphere Inc. worked with elementary through high school students at Southwark House on interior and exterior murals, as well as art workshops that integrated learning core subject areas with art. We assisted the students in decorating stairwells, made their basement into a fish-themed learning environment, created the above mural outside the building with art material themed installation, and designed a hand themed sign above their door. Art Sphere Inc. also consulted on classroom design at Southwark House (101 Ellsworth St, Philadelphia).